Here are the Top 10 ebooks downloaded from the Free Library's OverDrive Digital Library in February 2016. More than 86,290 ebooks were checked out and downloaded for the month! Only one new entry to this month's Top 10, the Historical Fiction title Kristin Hannah's The Nightingale. 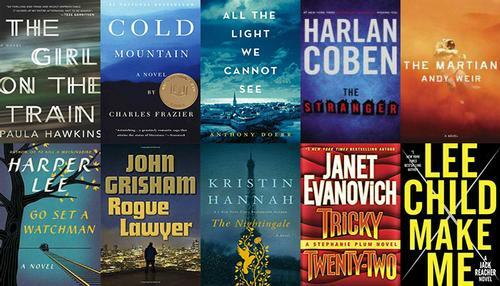 The rest of this month's list is similar to last month's, just with title orders shifting around, including the 2016 One Book, One Philadelphia selection Cold Mountain, the latest David Baldacci thriller The Guilty, Andy Weir's outer space survival adventure The Martian, and long-running genre series entries from Lee Child, Janet Evanovich, Gillian Flynn, Harlan Coben, and John Grisham respectively. Named a top five book of the year by Amazon, as well as Best Book of the Year by Buzzfeed, iTunes, Library Journal, Paste, self.com, The Wall Street Journal, and The Week, it's no surprise that Kristin Hannah's The Nightingale has finally cracked our Top 10 most downloaded ebooks list. The story of two sisters, separated by years and experience, by ideals, passion and circumstance, each embarking on her own dangerous path toward survival, love, and freedom in German-occupied, war-torn France, will have you believing in the indomitable power the human spirit.